We need you! We need you and your solidarity with "Lampedusa in Hamburg" by participating in a photo project. 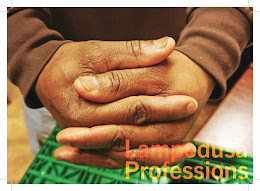 The idea is to make the people of the group "Lampedusa in Hamburg" publicly visible in their professions. We are looking for people in Hamburg with matching professions or trades who are willing to offer their workplace for a photo for this project as an example for the general public. The resulting exchange is as important as the photo. A group photo will be made as a `thank you´ for participating.